Cold seats are a thing of the past with the CoverCraft Seat Heater. Thanks to a new compact heated seat element, this heater simply installs under seat covers. This eliminates the need for professional installation and provides an easy do-it-yourself experience. 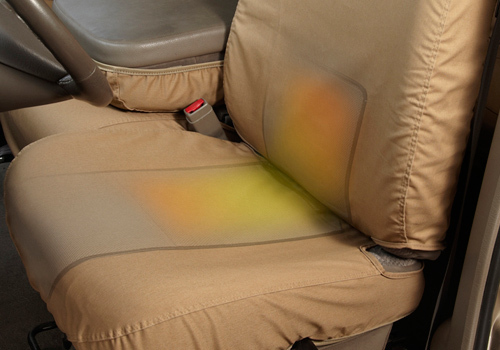 Each Seat Heater includes unique envelopes that securely hold the heating elements which facilitates an evenly distributed heating supply. The PTC elements deliver even and efficient heating for the entire seat, which compares to most OEM seat heaters at half the price. Simply plug the power supply to your vehicle accessory power outlet after installation for immediate heat, it's that easy. Don't spend more than you have to when it comes to efficient and even heating for your vehicle's seats. CoverCraft Seat Heaters are an affordable and easy option for the average person who is just tired of fighting the cold on those rough winter days. Purchase your set today and reap the benefits that superior functionality has to offer.